^ a b "JSC History". Retrieved March 25, 2008. ^ Strauss S, Krog RL, Feiveson AH (May 2005). "Extravehicular mobility unit training and astronaut injuries". Aviat Space Environ Med. 76 (5): 469–74. PMID 15892545. Retrieved August 27, 2008. ^ a b c d NASA. 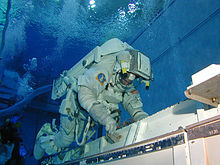 "Astronaut Selection and Training". Retrieved August 27, 2008. ^ "NASA Awards Mission Operations Support Contract". NASA.gov. NASA. July 14, 2014. ^ NASA. "Ochoa Named Johnson Space Center Director; Coats To Retire". Retrieved January 29, 2013. ^ Fitzpatrick DT, Conkin J (2003). "Improved pulmonary function in working divers breathing nitrox at shallow depths". Undersea Hyperb Med Abstract. 30 (Supplement). Retrieved August 27, 2008. ^ Fitzpatrick DT, Conkin J (July 2003). "Improved pulmonary function in working divers breathing nitrox at shallow depths". Aviat Space Environ Med. 74 (7): 763–7. PMID 12862332. Retrieved August 27, 2008. ^ NASA. "Johnson Space Center: Exploring the science of space for the future of Earth" (PDF). NASA. Retrieved August 27, 2008. ^ "Johnson Space Center to continue biomedical research". Houston Business Journal. October 2, 2007. Retrieved October 18, 2009. ^ "Comparison of V-4 and V-5 Exercise/Oxygen Prebreathe Protocols to Support Extravehicular Activity in Microgravity". NASA Technical Reports. Retrieved October 18, 2009. Dumoulin, Jim (1988). "LYNDON B. JOHNSON SPACE CENTER". NSTS Shuttle Reference Manual. 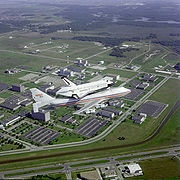 NASA: Kennedy Space Center. Retrieved January 19, 2010.